Ours came dented but overstock handled it quickly and was able to provide everything we needed for the exchange. This sits by our front door and fits perfectly to place keys and things on as we come in and out. Dimensions 29.5 in. H. x 35.8 in. W. x 13.8 in D.
The unit arrive broken. I requested a refund only. The product was very cheap looking, made with cheap materials and the finishes were poor. This item arrived broken in pieces. It's not even made of particle board-- it's something lighter and less dense than that. If I saw this at a store, I wouldn't pay more than $30 based on the quality. It looks like it does in the picture, a little darker though, but upon inspecting all pieces, I noticed 2 legs had the pegs drilled too far into them and they were cracked from the bottom to the middle. The pegs were crooked as well, which would have proved difficult if not impossible for me to put it together. 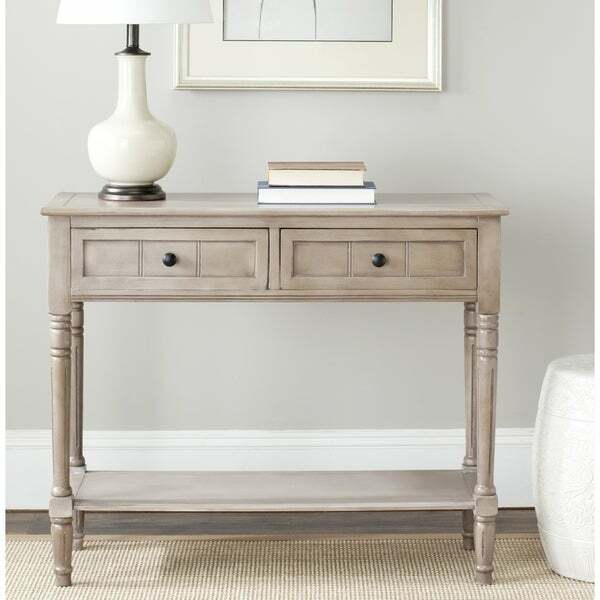 I love the style and size of this console table. Specifically, it fit perfectly in our small apartment entry way. However the quality isn’t there. The wood has cracked where the drawers meet in the middle. If you not looking for a hight quality console table it's an ok table to buy. The color is very neutral and nice and goes with any room color. The overall design and look of the console is nice. It's a bit flimsier than I expected. I thought it would feel a bit more solid. It's also smaller than I anticipated and doesn't work in the space intended. I had to find another nook for it. Love this item! Perfect for my hallway. Color matches the picture. Highly recommend!! I was a little worried about buying this because of some of the reviews but I am very pleased. It is sturdy and the fact that it took 5 minutes to put together is worth double the price in my opinion! The color is slightly more grey than the photo. Exactly as pictured. Great quality and nice color. Comes somewhat assembled and the rest of the assembly (screwing in the legs) was super easy. Very beautiful piece for a great price! Great color. Easy to assemble legs. Fits perfectly in a small entryway. Nice entryway table. It's not too bulky but there's enough space for decorations and pictures. This little table fits perfectly where I need it and looks nice. However, it arrived with two broken parts completely detached from the frame. Since it’s being used at a back door near the laundry room, I am going to glue, clamp, and keep this item. However, this is the third item I have received damaged from Overstock in the last month, and I am beginning to wonder whether I should continue to do business on this site. This was purchased a few years ago for our medical office. We get so many compliments on it. It is a nice, sturdy piece. We put our plant on top of it and its just gorgeous. I would highly recommend this piece. Fits perfectly in the front hall, enough space to hold a small lamp, key holder, flower vase, and a random baseball cap. The color is nice and neutral and we've enjoyed it for almost 5 years. easy to put together and nice for the price !! The style was what I wanted for an entryway console. Sofa tables can be strictly decorative, provide a space for storage, or provide a useful buffer between the back of the sofa and the wall. Use the following tips to pick out the perfect sofa table for your space.